COUNCIL OF NATIONAL DEFENSE WOMAN'S COMMITTEE--IOWA DIVISION Webster City 1/9/18 My dear Mr. Maurer: I have been writing to the following to ask them to serve as members of the committee from our organization on the War Savings Campaign. If you ought to publish without waiting further, I suppose it would be safe. I know all will serve unless leaving home or something. Will probably hear soon. 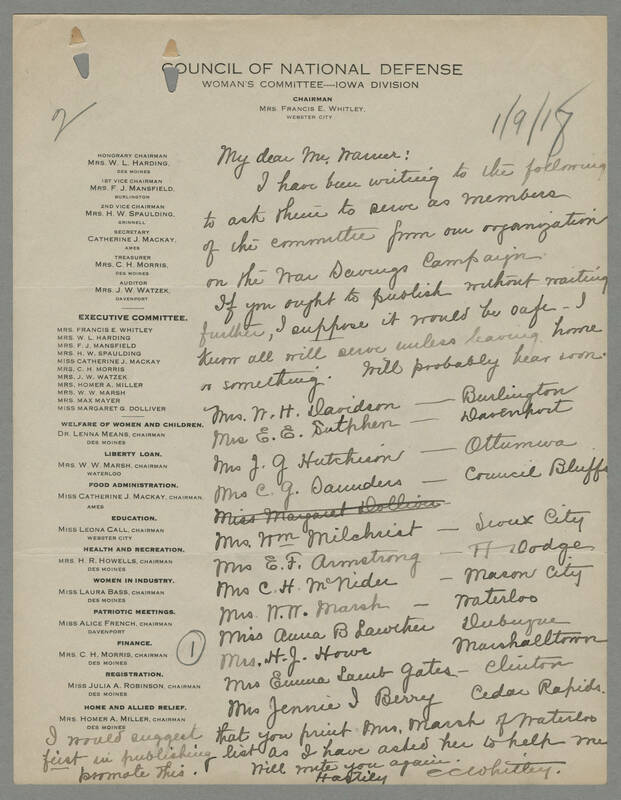 Mrs. W. H. Davidson - Burlington Mrs. E. E. Sutphen - Davenport Mrs. J. G. Hutchison - Ottumwa Mrs. C. G. Saunders - Council Bluffs Mrs. Wm Milchrist - Sioux City Mrs. E. F. Armstrong - Ft. Dodge Mrs. C. H. McNider - Mason City Mrs. W. W. Marsh - Waterloo Miss Anna B. Lawther - Dubuque Mrs. H. J. Howe Marshalltown Mrs. Emma Lamb Gates - Clinton Mrs. Jennie I Berry Cedar Rapids I would suggest that you print Mrs. Marsh of Waterloo first in publishing list as I have asked her to help me promote this. Will write you again. Hastily C C Whitley.